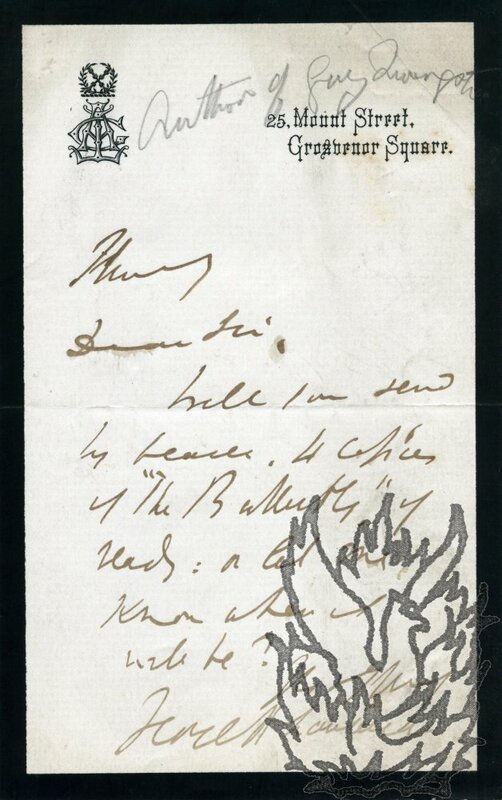 Autograph Note Signed ('George A Lawrence') to unnamed publisher [Tinsley?]. Undated. On monogrammed letterhead of 25 Mount Street, Grosvenor Square, London. 12mo, 1 p. Six lines. Mourning border. Text clear and complete. Aged, creased and a little grubby. Asking to be sent '4 copies of "The Butterfly", if ready', and if not to be told 'when it will be'. 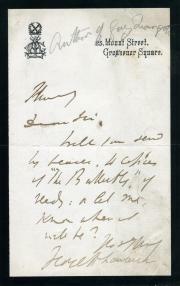 Lawrence published his 'Breaking a Butterfly; Or Blanche Ellerslie's Ending' anonymously by Tinsley in 1869.